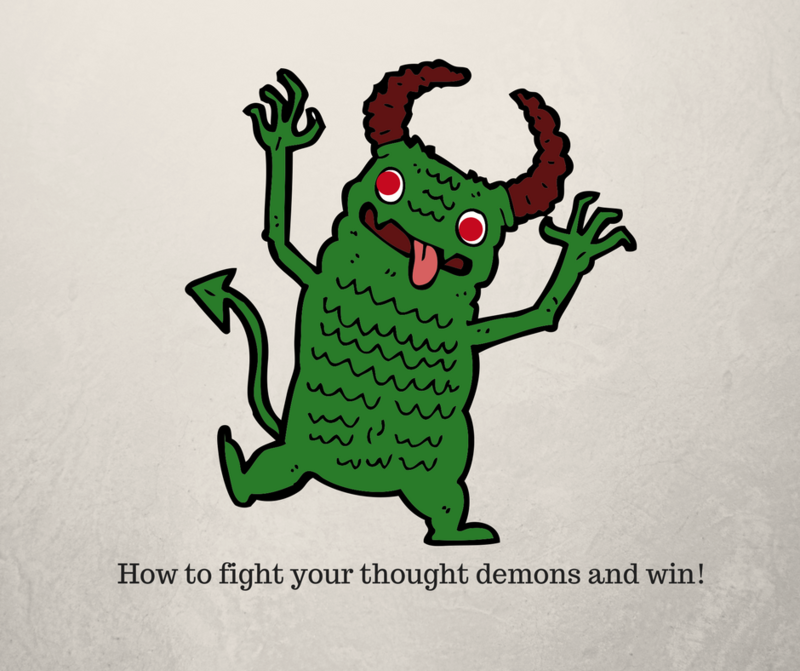 How to fight your negative thought demons and win! Kasha watched as a demon rose from the earth and solidified before her. Its bulging red eyes fixed on her and it moved to attack. She took up her best ninja stance and conjured a ball of pure energy into her hands. As the demon approached, she took a deep breath and aimed. The energy ball shot forward. There was a thunderous crack! The demon transformed into to smoky grey ribbons – dispersing into the ether. Thoughts are not only in your brain. They are physical energy and have substance. It is just that you can’t see them, as you can’t see air. Negative dark thoughts and the mind chatter worries are just like demons; rising and solidifying. They grow big and destructive. They activate your fear reaction, impeding your ability to think clearly so that you can solve the problem rationally. Anxiety becomes rife and a constant companion. Kasha conjured a ball of energy to fight the demon and you can do this too. She had to prepare and train to be able to do this and so will you. Here is how to go about it. Recognise when your demons are appearing. Take time to write down your negative thoughts so that you are aware of when they are ‘attacking’. Make them physical and tangible – write the words or draw the story as suits your style. Acknowledging is always the first step for change. This means you are being consciously aware. Thought demons like the dark so in doing this, you are bringing them into the light. Demons love the energy of negative attention and get bigger and more substantial if you oppose them. When they arise, give them positive attention; notice them and acknowledge them. Energy ball ingredient #1: For each of the negative thoughts you are aware of, decide what thoughts will benefit you most, to replace your demons. Write these as affirmations – begin with ‘I’ and continue with words that say it is already happening. e.g. I am doing ‘this’ with ease. (as opposed to ‘I can’t do this it’s too hard’ demon) These are powerful ingredients in your ‘energy ball’. Create your vision of how you want to be. Energy ball ingredient #2: Take a quiet moment alone to breathe into your belly, relax and see yourself being confident and successful. This is a powerful ingredient in your ‘energy ball’. Hit those demons with your energy ball. Once you have done step 4, take a breath into your belly, gathering positive energy, and bring your success image to mind. Now then replace them. Say the affirmation you have prepared several times. Remember the saying, “The bigger they are the harder they fall”? Often people spend their lives with these demons believing they are the truth. When you notice that you are feeling unhappy and not good enough, it is time to make those demons large and substantial so that they will fall hard and be transformed into the contents of your energy ball! – Your vision of being fully confident and successful. Remember this doesn’t just happen by itself. Transformation takes intention, preparation and practice. Like to have some guidance? I invite you to be guided to create your energy ball and transform your demons. I am available for private sessions – A Calm and Connect Session will start your journey to freedom from thought demons! Book a Calm and Connect session here. Any questions? You are very welcome to contact me to discuss your needs. Excellent teaching Betsy. I am confident many will find this useful.